See the variations below for more tips and tricks, including my favorite: an all-vegan ultra-creamy, rich Mutter Tofu-Paneer – with soy milk or almond milk and a ground cashew boost! It’s like North Indian and North American pure vegetarian kitchen smarts working together. Press the block of tofu wrapped in dish cloth with plate or book on top to remove excess water. After 20 min, unwrap, cut into medium cubes. Combine lemon juice, soy sauce, nutritional yeast, corn starch in bowl. Add tofu cubes, mix well, coat all pieces. Heat oil in saucepan on medium high. Fry battered cubes evenly until golden brown, about 5 min. Blend tomatoes with 3/4 cup water in food processor or blender until smooth. Heat 2 Tbs oil in large pot on medium heat. Add mustard seeds. After they start to pop (about 30 sec), add garlic, onion, ginger, ground coriander, cumin, garam masala, turmeric, paprika, curry leaves, asafoetida. Fry, stirring constantly until onions and garlic begin to brown, about 2-3 min. Add lemon juice and sugar. Pour in tomato pureé. Stir well, return to low simmer. Reduce to medium low heat. Simmer until sauce reduces and goes from pink to dark red, 10-15 min. Mix in peas. Stir reguarly, cook 3 min. Garnish with dried fenugreek leaves or fresh, chopped coriander leaves. Serve with basmati rice, naan or chapati. Smoked Tofu: Skip the marinade and tofu-paneer frying; Use an equal amount of smoked tofu. No Tofu: Replace paneer cubes with fried potatoes or mushrooms. Vedic: Substitute a pinch asafoetida for garlic and onions. Rich & Creamy: Use coconut milk, almond milk, soy milk, or soy cream instead of water. Add 1 Tbs tomato paste, and 1/4 cup ground cashews along with peas. 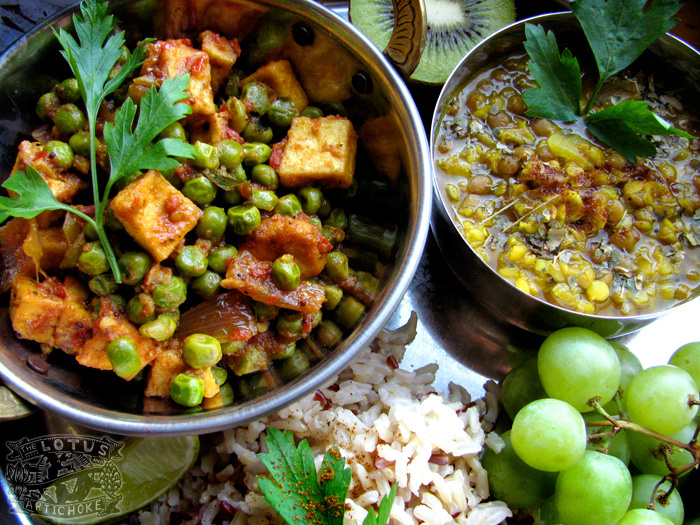 This entry was posted in North Indian and tagged mutter, north indian, paneer, peas, recipe, tofu, vegan. Bookmark the permalink. This looks divine… and sounds amazing, I’m fixing to print it out to try! Thank you. I think I’ve just found my new favourite food blog in you! Every single thing is making my tummy rumble. Gorgeous recipe, gorgeous photos! I’ll be back! Thanks, Sanjana! I love your site, too. And not just the Indian stuff (amazing!) but the other exotica, too! I might like to ask you for some tips to improve my Dhokla. I had lots of help in India but am finding it difficult now and am trying to perfect my recipe for the cookbook and blog. Justin, Absolutely delicious.. Made this last night and it was a big hit. Can’t wait to try more of your recipes. Thanks, Lisa! So glad the Mutter Tofu Panner was a hit! We love it here, too, and make it often. ;-) Do tell me what you cook up next! I love to hear about it. Thanks, Mindy & Ligeia! So glad you’re enjoying the recipes. I need to visit your page and blog again soon to catch up on your travels and posts! Is there a substitute for curry leaves? Hi Michelle, you could use 1 or 2 bay leaves, or omit them. The curry leaves provide a nice authentic taste… fresh are best, but the dried ones are ok too! enjoy! Let me know if you try my recipe, I’d love to hear how it goes. From my experience, the tofu in India is good as long as it’s fresh and has been kept cool. Pressing the tofu to remove the moisture is very helpful for increasing the flavour (allowing a better marination) for any tofu that comes in water. Another possibility is to get packaged smoked tofu which is already pressed and then just add that to the curried peas. I’m not sure what the tofu availability is where you are. Good luck!